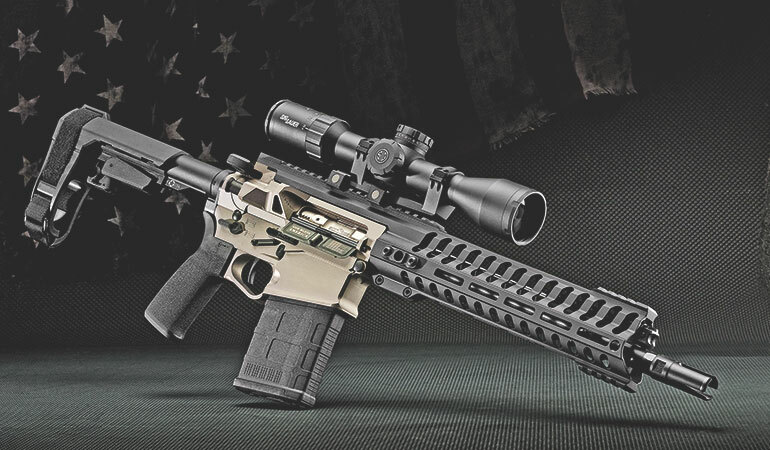 Patriot Ordnance Factory, Inc. (POF) has been making very good and very unique products for more than 15 years. Now they’re at it again with a new AR pistol. 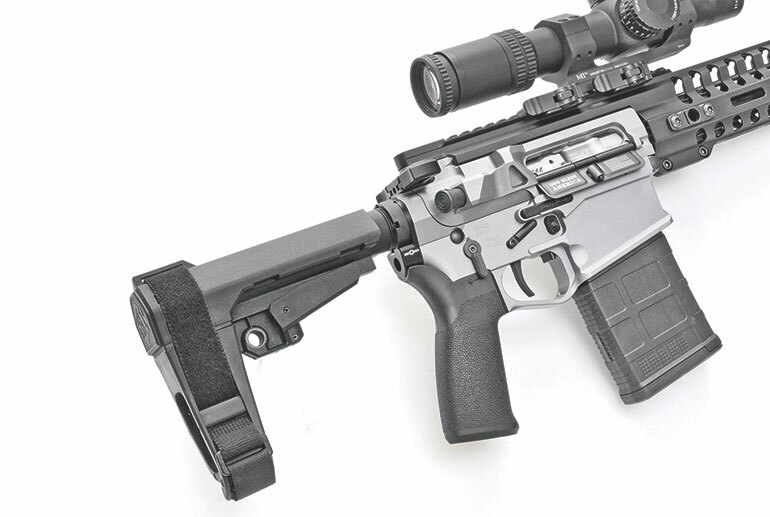 The latest creation from POF is a twist on the Revolution .308 AR rifle. The new Revolution Pistol remains in .308 but is the size of a .223 AR. 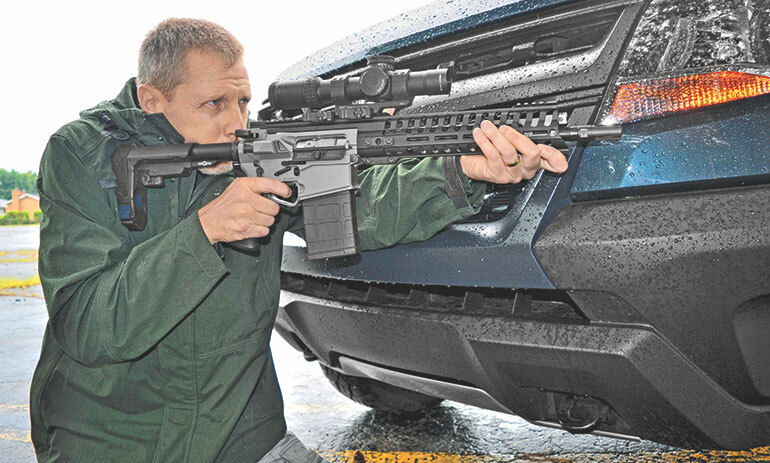 This isn’t the first time a .308 AR has been shrunk from its original AR-­10 sizing — far from it. Colt did it with their Model 901 in 2012 and DPMS had their Gen II about five years ago. As those guns have receivers and many assorted parts that are smaller than you’ll see with traditional .308 ARs, they are still bigger than the AR-­15. POF calls them “intermediate size” rifles, which is a fair label. The .308 POF Revolution has the same receiver dimensions as a 5.56/.223 AR-­15. 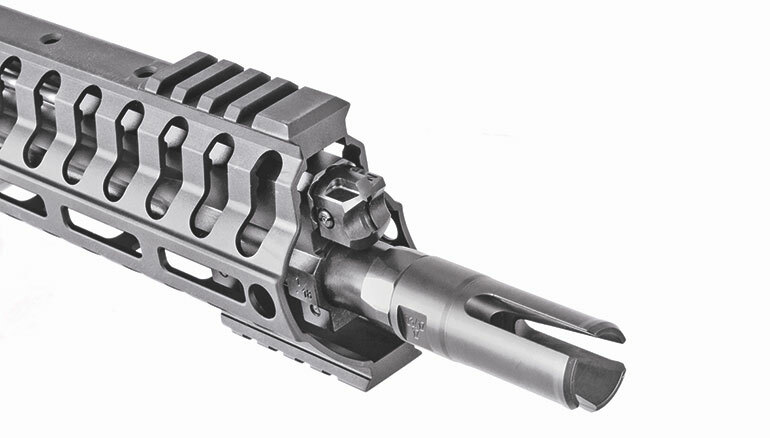 The AR pistol features many 5.56-­dimension parts such as the charging handle, bolt carrier, cam pin, buffer, heat sink barrel nut and handguard. The barrel extension, bolt assembly and the upper and lower receivers are the exact same size as those on an AR-15. Before I dive into how it works, let’s look at the what they did to get it this size. The POF’s .308 Revolution bolt carrier (top) compared to a Mil-Spec 5.56 BCG (bottom). There is very little dimensional difference. To shrink a .308 AR down to .223 dimensions, POF started with a bolt carrier that is the same length and diameter as that of a .223 AR. The main difference you’ll see is at the bolt face, which has been opened up. A 5.56/.223 has a cartridge base width of .376 inch. A .308 Win./7.62 NATO cartridge, on the other hand, has a base width of .470 inch. That’s not a small difference. The bolt face on the POF Revolution (left) has thinner walls to accommodate the fatter cartridge. The bolt is made of a proprietary steel. The sidewalls of a .223 bolt are a lot thinner. Theoretically, this makes the bolt weaker, so I asked POF about that. As for the steel POF uses in the bolt, POF is keeping that a closely guarded secret. The buffer in the Revolution appears to be a standard 5.56/.223-carbine type, but the buffer spring is definitely proprietary to this gun. To offset the recoil impulse of the .308 cartridge, firearms designer Eugene Stoner, in 1956, used a big, heavy bolt carrier on the first AR-­10s. The receiver of the AR-­10 is quite a bit longer than the AR-­15. The barrel nut was bigger, which means the handguards are bigger. All of this added size and weight. But after nearly 60 years of research, engineers have realized that a big bolt carrier isn’t necessary. So, if you can downsize the bolt carrier, you can downsize the receiver. 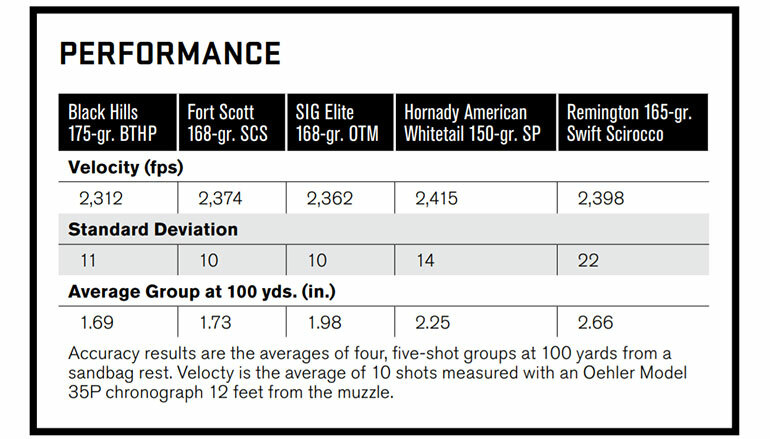 Rifles in .308 operate at pressures only slightly higher than those in .223, and yet the bolt carrier group (BCG) of an AR-­10 is much heavier than that of an AR-­15. If you’re firing very light or very heavy bullets, or using a powder with an unusual burn rate, your AR-­10 may not run, because it needs a certain pressure at the barrel’s gas ports to cycle that heavy bolt carrier. That is why .308 ARs are traditionally much more ammo-­sensitive than .223s. That is why I think .308 ARs, that use lighter-­than-­standard bolt carriers might be more inherently reliable because there is less weight for the gases to move. But don’t you need that big, heavy bolt? After all, the .308 provides substantially more recoil than the .223. When I was younger (but not that much younger), I knew that reducing weight on a gun meant increased recoil. That’s just basic physics, right? Felt recoil has as much to do with the reciprocating weight in your semiauto as it does with the power of the cartridge and the weight of the gun. With a bolt carrier that is roughly the same weight as that of a .223, there is much less reciprocating weight in the Revolution. Between the lighter carrier, bolt and buffer, that’s less mass slamming back and forth with each shot, which means less felt recoil. The “intermediate size” DPMS GII weighed in at 7¼ pounds. This pistol, however, with a shorter barrel, weighs 6.9 pounds empty. The provided SBA3 arm brace from SB Tactical is five-position adjustable and enhances the versatility of the pistol. At the back end of this gun is the SB Tactical SBA3 arm brace. 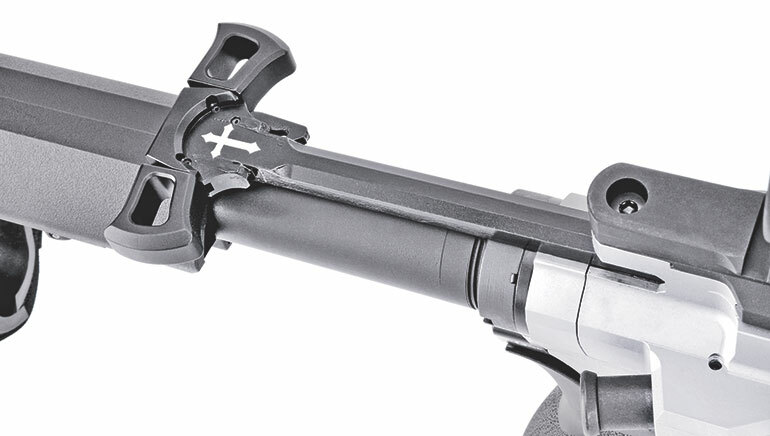 It’s a five-­position adjustable brace that fits over a standard carbine receiver extension. With the brace collapsed, the pistol is 29.5 inches long. Just remember, because it is a pistol, it still remains illegal to mount a vertical foregrip on it. Angled foregrips are legal though. And no, that doesn’t make sense to me either, but gun laws have never been about sense or reason. The Revolution sports a 12½-­inch fluted barrel with a black nitride finish. The barrel is tipped with a three-­prong flash hider very similar to the Vortex design, which is the most effective flash hider I’ve ever tested. Just behind the three-prong flash hider is the knob to adjust POF’s five-position gas system, which guarantees proper cycling when clean, dirty or suppressed. POF rifles, including the Revolution Pistol, feature its E2 dual-­extraction technology, otherwise known as a fluted chamber. To aid extraction, four small channels are cut into the chamber. That allows a small amount of gas from the fired case to come back against the neck, breaking any potential seal against the chamber and pushing backward at the same time. This drastically reduces the load on the extractor. Inside the handguard at the rear of the barrel, you might notice what looks like an oversized barrel nut. This is part of POF’s heat sink barrel nut. It is three inches long, completely encompassing the chamber and throat area of the barrel. It is not technically fluted but has fins to radiate heat. POF’s oversized barrel nut is made of aluminum, specifically because the material radiates heat faster than steel. The company states that its nut design provides 17 times more heat dissipation than a standard barrel nut. The channels between the fins also provide a support surface for the operating rod. The barrel is nestled inside POF’s Modular Railed Receiver (MRR). It’s a two-­piece design that includes the handguard and a rail, which clamps over the top of the upper receiver. 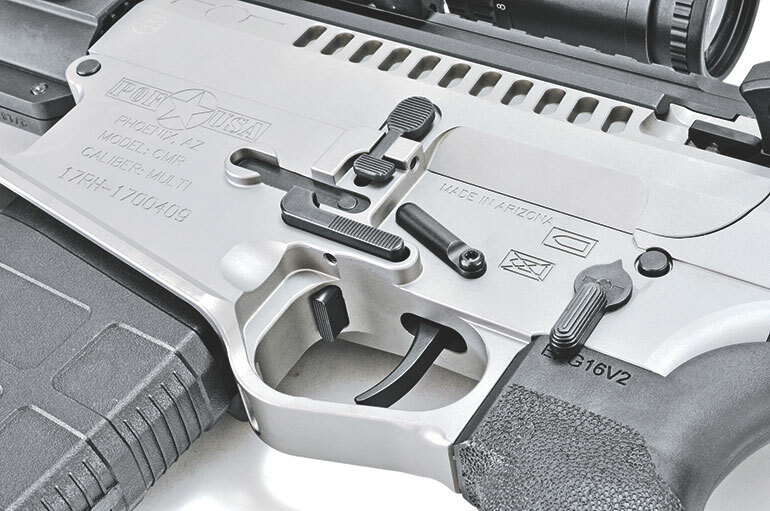 The 11½-­inch handguard has M-­LOK attachment slots at 3, 6 and 9 o’clock, with quick-detach (QD) sockets at the front and rear of the unit at 3 and 9 o’clock. The handguard also has M1913 rail segments at 6 and 12 o’clock near the muzzle end for attaching a front sight or grip. 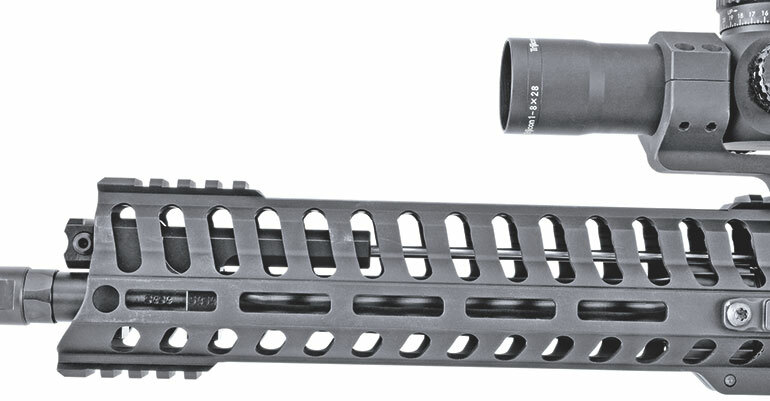 This handguard is a narrower design than earlier models. It is only 1¾ inches wide and slightly lighter. As a result of the MRR mounting atop the upper receiver, the height of the receiver rail is ⅜ inch higher than is usual with an AR. That means any optic you mount on the rifle will be ⅜ inch higher off the stock, so you will probably want to use a lower scope mount than normal. The rail at the end of the handguard is at the same height as the MRR rail in back, so if you mount iron sights, they will be at the same height. There are screw holes in the top of the handguard, so you can mount an additional rail along the top of it. The Revolution features POF’s Regulated Short-­Stroke Gas Piston System. 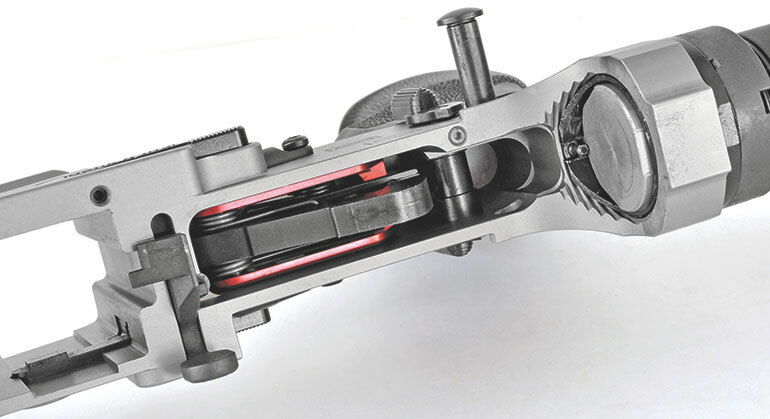 Rather than sending spent gas from a fired cartridge down a tube directly to the bolt carrier and into the receiver as with a standard direct-impingement (DI) gun, a gas-piston system acts on a piston head positioned over the gas port. 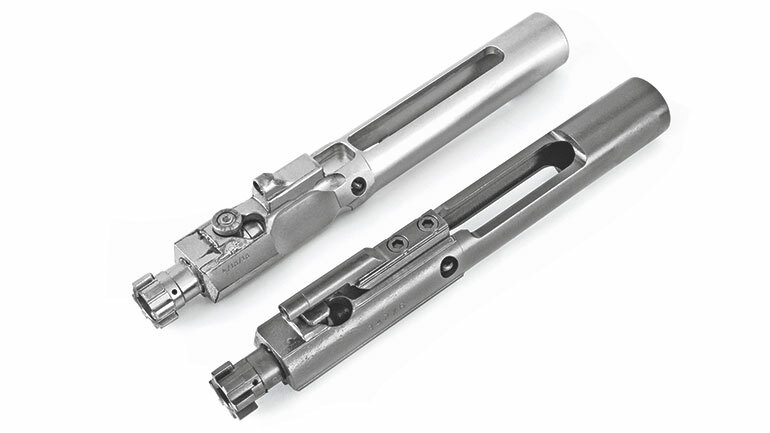 That piston then acts on an operating rod, which moves backward and cycles the bolt carrier. POF uses a proprietary short-stroke gas-piston system, seen here under its 11½-­inch handguard with M-LOK slots. Adjustable to five different gas settings, the gas system allows the shooter to increase, restrict or even shut off back pressure. This is great when shooting a very dirty gun or attaching a suppressor. The gas block plug and piston components can be disassembled for cleaning without using tools or removing the handguard. POF has taken a different approach to fix this issue with its anti-­tilt buffer tube with a carrier cradle. Instead of an oversized carrier, POF simply extended the buffer tube. Standard buffer tubes on an AR-­15 are threaded forward into the lower receiver until they abut the buffer retaining pin. When in battery, the back of the bolt carrier is outside a standard buffer tube. The trigger is POF’s cassette design, which provides a crisp match pull. If you look closely, you can see the bottom of the buffer tube is extended forward past the retaining pin and buffer. This “carrier cradle” cups the BCG at all times and is designed to prevent carrier tilt. The POF buffer tube extends farther forward, and it features a slot for the buffer pin. The buffer tube extends far enough forward that the carrier rests on the buffer tube even when the bolt is closed, cradling the carrier. The buffer retaining pin fits in a slot in the extended buffer tube and keeps it from rotating. The buffer tube also sports three drain holes, one in each of the rear three stock detent holes. 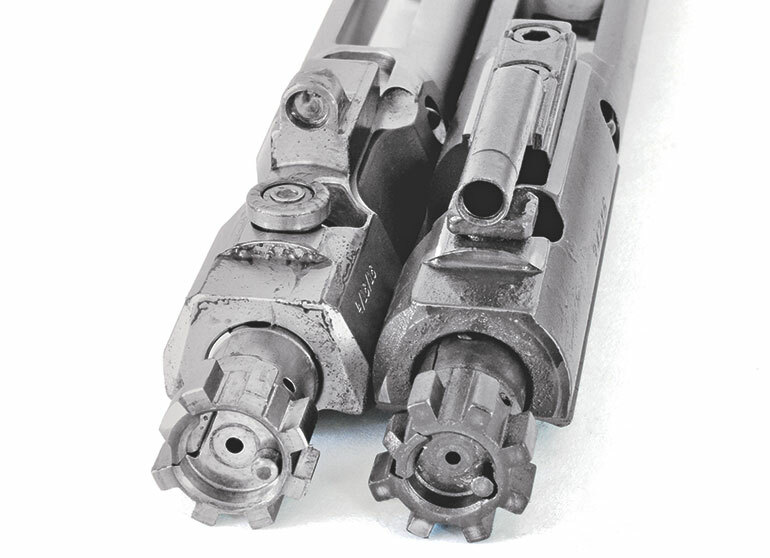 The bolt carrier is all one piece, with the mechanical key (the part impacted by the op rod) built into the carrier body. The carrier is high phosphate-nickel coated. This coating is both slick and corrosion resistant. The bolt, extractor and firing pin are all chrome plated. The POF bolt carrier group (BCG) features a round NP3-­coated roller cam pin, designed to reduce friction and drag in the action. The inside of the ejection port cover features both the words “GOD BLESS AMERICA” and the American flag, turned to indicate the shooter is moving forward. The lower receiver is POF’s Gen 4 model. This is billet machined with a slightly flared magazine well and features a bilateral magazine, bolt release and safety selector. The black version of this pistol has color-­filled bullet icons for the selector, but with the silver color on this receiver, POF didn’t color in the bullet icons. POF has some of the best bilateral controls on the market. The tab on the inside front of the triggerguard allows you to lock the bolt back with your trigger finger. In the photos, you also might notice a steel tab pointed downwards inside the triggerguard, just behind the magazine well. Push upward on this with the tip of your trigger finger while you’re pulling the bolt back, and it will lock the bolt rearward. Pretty nifty, and you won’t even know it’s there unless you go looking for it, because it is not in the way. If you pop the receiver open, you’ll see one screw at the top of the lower receiver, just forward of the rear receiver pin. This is a tension screw made of Teflon and can be adjusted to provide a custom uber-­tight fit to the upper receiver if desired. The trigger unit is POF’s drop-­in model, a single-­stage unit advertised as providing a 4½-­pound pull. My test gun’s pull was 4¾ pounds and beautifully crisp, with no take up and almost no overtravel. The trigger pack is secured in the lower receiver with a set of KNS anti-­walk pins. For years, POF put Mil-Spec charging handles on its high-end rifles, but finally it’s equipping its high-speed guns with high-speed charging handles of its own design. This one is POF’s bilateral Tomahawk model. The POF Revolution sports the oversized, ambidextrous Tomahawk charging handle. If you look at it from the top, you’ll see where it got its name. In profile, it looks exactly like a double-­bladed axe. The pistol grip is Mission First Tactical’s Engage Version 2, which features a more vertical (15-­degree) angle than the original pistol grip. The Revolution Pistol uses DPMS/Magpul-­pattern magazines. One 20-­round Magpul PMAG ships with the pistol. Right now, there are just two versions of this pistol, an all-­black model and the one I was sent, which features an upper and lower receiver coated with NP3, which is grayish-­silver in color and slightly slippery to the touch. Surprisingly, that extra slick corrosion-­resistant finish only adds $30 to the cost of the rifle. I put a lot of rounds downrange through a DPMS GII, doing full mag dumps. While it had more recoil than a standard 5.56, it had noticeably less recoil than a traditional .308. So, I was both curious and excited to put rounds downrange through the POF Revolution and compare it to my experience with an “intermediate size” .308 AR. You know you’re going to lose velocity from a .308 when shooting it out of a short barrel. What you gain, however, is a much shorter, handier piece that hits heavy and hard. I think of firearms like this as urban carbines, even though, technically, the POF Revolution is a pistol. A firearm the size of the Revolution is small enough to work in and around vehicles and take through doorways. 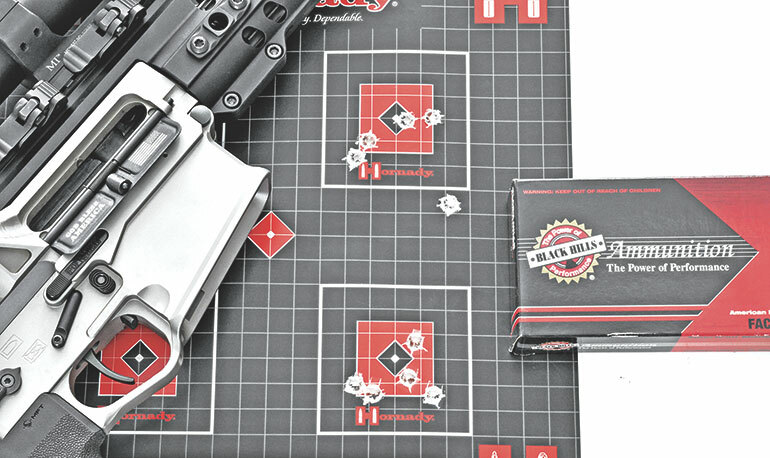 With the above in mind, I topped my tester with the Trijicon AccuPower 1-­8X scope. I had the scope locked in a QD mount from Midwest Industries. Designed for a standard AR rail height, it was a tad high for the POF but more than workable. As for exactly how much velocity you lose out of such a short barrel, the answer is roughly 300 feet per second (fps). While that’s not an insubstantial number, out of a 12½-­inch barrel, the .308 is still hitting significantly harder than a 7.62x39 or .300 Blackout. Plus, your ammo selection in .308 is huge. The POF Revolution Pistol absolutely loved Black Hills’ 175-grain BTHP load, and here are the two best groups at 200 yards. The POF digested everything I fed it. I tested the short barrel out to 200 yards, just because I could. Short barrels are not inherently less accurate than longer barrels. The issue is firing rifle cartridges out of short barrels, and whether or not the slow-­burning rifle powder inside those cartridges has a consistent burn rate down that short tube. Whatever length of .308 barrel is “too short,” 12½ inches wasn’t it. Testing provided me with very low standard deviations in velocity. As for accuracy, the POF pistol was roughly a 2-MOA gun, which is more than acceptable for its size. It seemed to love the Black Hills 175-­grain BTHPs, and my best group with this load was a solid 1.48 inches at 200 yards. I’m pretty sure the POF Revolution pistol in .308 is powerful enough to take any game on the North American continent, accurate enough to be employed in a counter-­sniper role and short enough to be maneuvered in and out of vehicles without an issue. It may be the most versatile AR in existence. Brace: SB Tactical SBA3 five-position adj.